Forte Diesel Particulate Filter Cleaner and Regenerator has been specifically formulated to combat the adverse effects that start/stop driving conditions have on Diesel Particulate Filter (DPF) regeneration. With a continued stop/start driving pattern, soot loading builds up in the DPF since the ECU is unable to make the necessary small adjustments to the fuel injection timing to increase the exhaust temperature and initiate regeneration. Forte DPF Cleaner and Regenerator uses a catalyst to adhere to the soot particles during combustion, lowering the temperature at which they can be burnt off. The soot particles will burn at lower temperatures in the soot filter area, helping to regenerate the filter, especially in cases where exhaust temperatures are low, like stop and go traffic, city traffic and short drives. 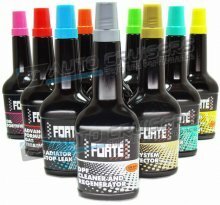 Forte DPF Cleaner and Regenerator should be used at regular service intervals in conjunction with Forte Advanced Formula Diesel Treatment and when the symptoms indicate that treatment is necessary. Aids passive regeneration of Diesel Particulate Filter. Improves stability of Diesel Particulate Filter systems. For diesel and bio diesel up to B30.